After a rain delay, IndyCar driver and owner of the most powerful name ever, Will Power, smoked the competition at the Sao Paulo Indy 300 today. The perennial polesitter, a member of the Verizon Wireless racing team since the 2010 season, was a favorite to win after coming in tenth at the April 17 Toyota Grand Prix of Long Beach, CA. Power faced torrential weather conditions and poor visibility in Brazil, but managed a victory—his second consecutive win on the Sao Paulo track. Power took the lead from Takuma Sato with just over seven minutes remaining and cruised to his second victory of the season. Will Power will be racing again at the Indianapolis 500 on May 29! Get in-race audio, video highlights and race alerts by downloading IndyCar Mobile on Verizon. 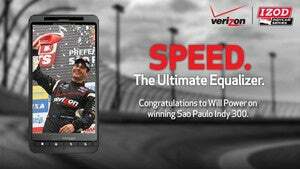 Head here to see Will's schedule, download IndyCar Mobile and get more info on the entire Verizon Wireless racing team!